I don’t want to let any more time pass before I mention that I’ll be shilling books and sketches at the Massachusetts Independent Comic Expo coming up on Saturday, Sept. 29th, in Cambridge, MA. Here’s a link to the MICE website. If you’re anywhere near the area, please come by (open from 10am to 7pm, and admission is FREE!) to chat, check out my book, maybe buy a sketch, and see the awesome list of other creators exhibiting at the event. (Seriously, this is a very cool list of folks.) I may also be selling some new goodies, if I can get things together; I have some Japanese folding paper fans begging to be drawn on, and who knows, maybe I’ll even have a mini-comic together by then. I aim high! If you’re thinking you’ll attend–either as exhibitor or visitor–please let me know! I’d love to chat about plans and thoughts for the show. Huge thanks to everyone who came out and stopped by to see me at MICE 2012 this past weekend! I met some new folks, shared some books and sketches, and generally had a good time. Props to Jynksie of Madbury, who table-sat for me so I could get out and see the show myself! Thanks! Getting ready for MICE nearly completely consumed the latter part of my week last week, so Friday’s strip was… delayed. Given that the comic in question has posted on Sunday, I’ll be holding off on a comic for Monday the first of October, and uploading something double-sized (and spooky, in the Halloween tradition) for Wednesday! I’ve been putting my con plans together for the year (a bit late, I know, but I’m still a bit convention gun-shy). I’m not planning on doing a ton, but shooting for at least two in 2015. Right now, I’m psyched for the Maine Comic Arts Festival in Portland, ME on May 17th (just about two weeks from now! 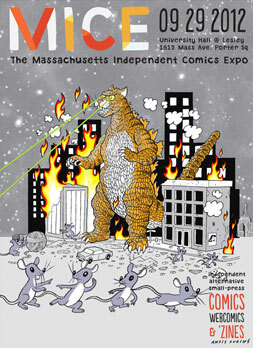 ), and I’m hoping to get into the Massachusetts Independent Comics Expo in Boston on Oct. 17-18. I’d love to hear from any of you out there going to either of those, or anyone who has suggestions of any other good New England shows for an indie/webcomics guy to sell books and meet readers. It was a fun Sunday in Portland, Maine! Perfect weather, and the same great character-rich location as last year. I met some great cartoonists, including table neighbors and uber-artists Brian Moore (brianmooredraws.com) and Dani Jones (danijones.com), and I got to reconnect with an old friend from college days, Anne Thalheimer (www.etsy.com/shop/mymonsterhat). Plus, my buddy John Forcucci (johnforcucci.com) came along, and you couldn’t ask for a better drive-and-table mate. Got to catch up again with Peet Tamburino (heymailman.tumblr.com) and Jesse Lonnergan (jesselonergan.blogspot.com), too, which was awesome. I’m realizing my shout-outs are just turning into a long list of names–awesome names, but names nonetheless–so I’ll just say: Thanks, everyone! The next big affair is MICE, out in October. Hopefully I’ll have some minis and maybe some graphic novel pages to show off by then!